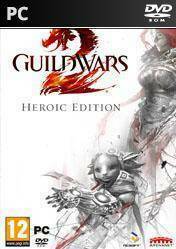 Guild Wars 2 is a MMORPG with amazing graphics and awesome gameplay level , in addition to lacking monthly subscription fee so that makes it even more attractive. It is currently considered one of the most played MMO without fees in the world, with millions of players. Guild Wars 2 features an innovative gameplay but maintaining the foundation that made ? ?it big the previous installments . This new installment takes us 250 years into the future to a radical re -imagined Tyria. In this new installment in the Guild Wars series , the decisions of our characters in a persistent world affect game development. It has a huge PVE map, loaded with thousands of quests , events and dozens of dungeons where to get the best possible gear for our heroes , but also its PVP and Realm vs. Realm mode, are considered the best in the moment, being tremendously fun and addictive , with gains of castles and fortresses. There are literally endless possibilities of customization and can create unique heroes throughout Tyria. Crafting , dungeons , PVP battlegrounds , massive battles vs Kingdoms, and occasional limited hours events , make it one of the best MMO to date. Also this version comes loaded with aid to begin our adventure: A legacy armor set, a box of mithril with 18 inventory spaces and 10 enhancers experience.